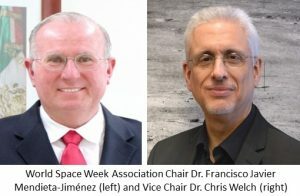 Adelaide (September 27, 2017) – Dr. Francisco Javier Mendieta-Jiminez, General Director of the Mexican Space Agency, was today elected Chair of World Space Week Association. Mendieta is the first head of a space agency to lead the Association. Dr. Christopher Welch was elected Deputy Chair, it was also announced today. Dr. Welch directs the masters program of International Space University. UN-declared World Space Week is celebrated October 4-10 annually. A total of 2,800 events were reported in 86 countries during World Space Week in 2016, according to the Association. The theme for World Space Week 2017 is “Exploring New Worlds in Space.” For more information on World Space Week, including planned events for October 4-10 around the world, visit www.worldspaceweek.org. Chair: Francisco Javier Mendieta-Jiménez, Ph.D.
Francisco Javier Mendieta-Jimenez is the General Director of the Mexican Space Agency. Prior to his appointment, he was involved in development projects on applications of optical fibers to electrical power systems at the Institute for Electrical Research, Mexico. Mendieta-Jiminez previously served as Director of the Applied Physics Division and General Director of the Center for Scientific Research and High Education of Ensenada, Baja, California (CICESE), where he formed the optical communications group and laboratory and lead diverse research and development projects on optical telecommunications, free space optical satellite communications and detection. He was a candidate astronaut for the Space Shuttle program, and leader in CICESE of the SATEX 1 Project, which was a coordinated national effort to develop human resources in space sciences around a microsatellite project. Mendieta-Jiminez has a bachelor’s degree in Mechanical and Electrical Engineering from National University of Mexico and his Certificate of Higher Studies and Doctor of Engineering degree from the National Superior School of Telecommunications, France, in the field of Optical Telecommunications. Vice Chair: Christopher Welch, Ph.D.
Chris Welch is Professor of Space Engineering at the International Space University in Strasbourg, France, where he is also Director of Masters Programs. Dr Welch is a Vice President of International Astronautical Federation and a member of European Commission H2020 Space Advisory Committee. His research interests are in space propulsion, microgravity science and planetary exploration. He has extensive media experience and a significant track record in both space education and outreach and higher education, receiving the 2009 Sir Arthur Clarke Award for Space Education and 2015 IAF Distinguished Service Award. Dr Welch is Vice-President of the British Interplanetary Society, of which he is a Fellow, and is also a Fellow of the Royal Aeronautical Society and Royal Astronomical Society. He sits on a number of boards including the Arts Catalyst and the Initiative for Interstellar Studies. He has PhD in Spacecraft Engineering (Cranfield University), an MSc in Experimental Space Physics (University of Leicester) and a BSc in Physics (Cardiff University). He has published more than 90 papers in journals, book chapters and conferences.